Southerners often cook black-eyed peas and collard greens on New Year’s Day. The tradition is said to bring health and wealth. If you need a few extra servings of greens and beans to keep that money machine rolling while backpacking, try dehydrating some. For leafy greens, I dry raw spinach leaves. Beans and spinach go well together with rice and ham. Dried spinach also combines well with tomato sauce leather and macaroni. I received a few letters asking about dehydrating home cooked beans. It seems their home cooked beans stayed hard when rehydrated. I have always dried canned beans because it saves time compared to soaking and cooking dry beans all day. Canned beans usually split open when you dry them which makes them rehydrate well. Home cooked beans apparently don’t split open, at least for some folks. The pressure cooking method used to cook canned beans is probably what makes them rehydrate better. If you have any home cooked black-eyed peas or beans left over after New Year’s Day, try drying some and let me know how they turn out. Any tips you want to share? For canned beans, drain beans and place directly on dehydrator tray. Consider rinsing first if the liquid is syrupy such as you might find with kidney beans. Dehydrate at 125° for six to eight hours. A 15-ounce can of any kind of beans yields 1 cup dry with the exception of black-eyed peas which yield about ¾ cup dry. I also run canned beans through the blender with other spicy ingredients to make Enchilada Bean Bark, Black Bean & Salsa Bark, and BBQ Bean Bark. See Print Backpacking Recipes. Choose fresh spinach without any dark mushy spots. Wash leaves and pat dry with paper towels. There is no need to trim the stems or cook the spinach. Spinach leaves take up a lot of space on the dehydrator tray, so start off with the spinach doubled up in two layers. Dehydrate at 125° for approximately four hours. After two hours the leaves will have shrunk enough to spread them out in a single layer. 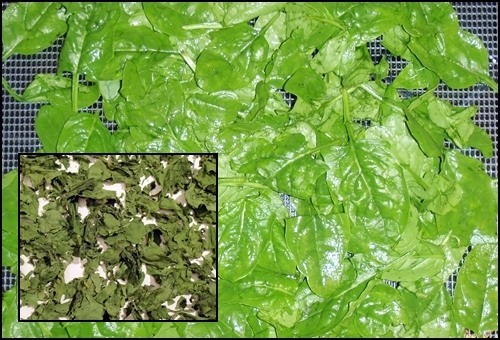 Place a mesh sheet over the spinach leaves when they are half dry because pieces may break off and start blowing around. One pound of spinach leaves yields approximately four cups dry, lightly crushed, not crumbled. ½ cup instant or precooked and dried rice, ¼ cup dried black-eyed peas or other beans, ¼ cup dried spinach, ¼ dried ham. Add salt and pepper to taste. Rehydrate on the trail with 1½ cups boiling water. Dehydrating Meat, Dehydrating Vegetables, Dehydrating Beans & Potatoes, Chicken & Rice Cacciatore, Easy Cheesy Rice & Beans, and Pumpkin Pie Bark. See Print Backpacking Recipes. Justin’s Stuffed Pepper Soup, Paul’s Quick Backpack Chili, and Zondra’s Indian Dal. See these excellent recipes or share one of your own at Your Best Backpacking Recipes. Thanks for sharing! We had snow almost every day for two weeks in the first half of December, but it all melted a few days before Christmas. I’m sure more is coming. Dominique and I wish you a Happy New Year full of exciting adventures and tasty meals. Look for the announcement that my eBook, Recipes for Adventure, is ready in the January newsletter. PS If you have questions about this issue of Trail Bytes or would like to add comments or suggestions, simply reply to this email or write to me on my contact page.